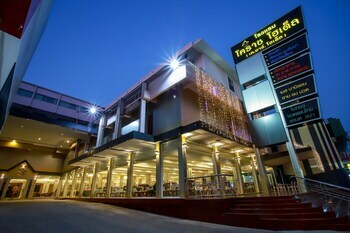 With a stay at Korat Hotel, you'll be centrally located in Nakhon Ratchasima, a 3-minute drive from Maha Weerawong National Museum and 8 minutes from Rajamangala University of Technology Isan. Featured amenities include dry cleaning/laundry services and a 24-hour front desk. Free self parking is available onsite. Located in Choeng Thale, Amin Resort is a 3-minute drive from Bang Tao Beach and 9 minutes from Surin Beach. The front desk is staffed during limited hours. Free self parking is available onsite.